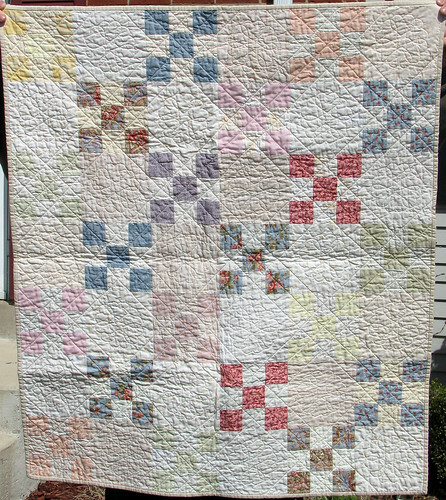 Here is a baby quilt I recently made for a friend who is due any day now. I wanted to make sure I got it done in time, so I went with an Irish Chain and used various soft hues I found in my stash. 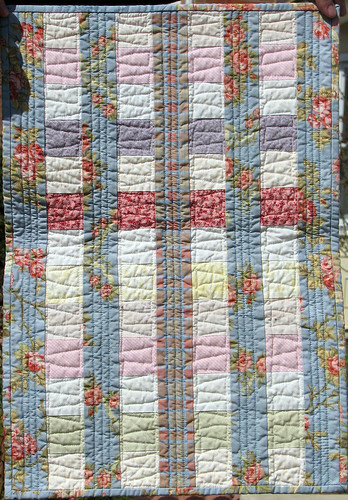 After I pieced it together, I thought it was maybe a little too simple, so I decided that the quilting itself needed to be a little bit special. Making the template for the heart wreath took a very long time, which was somewhat frustrating since I’m sure someone has done it before and I could have just copied it. But, I suppose this way I was able to be sure it was exactly the size I wanted. In any case, marking the quilting for this quilt took the most time of any other step along the way. I get impatient with what I perceive to be wasting time. And, finally, here is a little doll quilt I made for the new big sister (2.5 years old). It is made from the same fabrics as the baby quilt. This was my first doll quilt and I love it. I love how fast it was to make and that it coordinates with the other quilt. Yay baby gifts! Kate what beautiful work. I’m sure the mom will be touched and the big sister will be thrilled with her own doll blanket. I love the quilting that you did on this blanket. 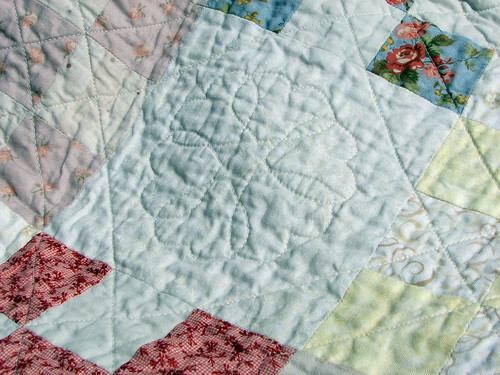 Too many quilts have just plain stippling – no character at all. wow, theres alot of hard work gone into that baby quilt!